Born in Omaha as the youngest child of Bohemian parents, Marie Jakl was a locally recognized painter beginning in the 1940s. After her death in 1983, her name and artwork faded from public attention. However, several decades later, thanks to Patricia Halderman, researcher from Lincoln, Nebraska, interest in Marie Jakl is reviving. After learning about her, Halderman concluded: “she was the most amazing woman! She was successful in everything she did and was very involved with the Omaha community. In addition to being an artist, she created a sophisticated collection of historically valuable dolls, and was recognized locally and nationally for her garden-club activities with flowers and landscape architecture. Youngest son Vincent became a meteorologist for Fort Omaha and also for surrounding states, and he lived at the Fort. Living together for the remainder of their lives were the middle son, Anton Jr. and his sisters, Barbara, the second born of the family, and Marie. By 1916, when Marie was age 26, they, along with the parents, occupied adjacent properties in Omaha at 2223 and 2227 South 20th Street. Anton, Jr., was listed as the owner of the real estate, and also as a “musician.” However, for many years he was an employee at the Union Pacific Railroad. In 1927, they moved to 509 South 51st Avenue, and in 1951, when Marie was 61, they moved to their last shared residence at 2107 South 40th Street. Marie lived there until her death in 1983, although was several decades by herself after sister Barbara died in 1956, and brother Anton in 1963. 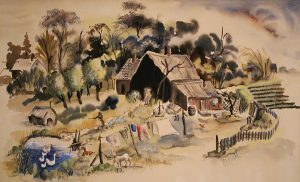 Among the attention Marie was receiving was acceptance in 1941 of her painting Nebraska Farm in the National Watercolor Exhibition in San Francisco. Many of her subjects were of urban Omaha such as Left Standing, a depiction of an abandoned structure near 32nd and Ohio Streets. It won the 1942 Omaha World-Herald Annual Exhibition prize, and in 1948, her wash drawing, St. Mary’s Church, a 64th and Dodge Street location, was another World-Herald contest winner. Down South, the painting purchased by Pat Halderman, depicts a farm in a location just north of Cuming Street in Omaha. Halderman learned by email from Meredith McGowan, Curator of the Lincoln Library Heritage Room, that Down South had been a Lincoln Artists’ Guild fund-raising donation to the Heritage Room which, running out of space, had made it available as part of a book sale. Further research by Halderman showed that the painting had been one of two Guild Collection artworks selected at its November 1947 exhibition from 330 Guild entries. Marie was also an avid gardener and won prizes for flower arrangements and her roses. She gave informational talks to many garden clubs in Omaha on how to arrange flowers and how to grow and design gardens. In 1942, she attended the National Garden Club Flower Show in Chicago, and then, representing Nebraska, went on to the International Flower Show in New York City. In Omaha she was elected president of the Hanscom Park Garden Club in 1946. In 1950 she, her sister Barbara, and brother Anton held an open house for the Hanscom Garden Club. According to her obituary, Marie Jakl died in Omaha in 1983 at age 92 “survived by many cousins.” She was interred at Calvary Cemetery, 7710 West Center Road, Omaha. The Museum of Nebraska Art has one work by Marie Jakl. McGowan, Curator of the Heritage Room of the Lincoln Library, Oct. 19, 2014 and Oct. 21, 2014; list of residences and family members; painting titles; copies of newspaper clippings; photo of the painting, Deep South; and excerpts from pertinent quotations. Museum of Nebraska Art files: Compiled notebook by Patricia Halderman titled Marie Jakl, Born September 8, 1890, Died January 1, 1983.